"So very sorry to hear of Ray’s passing! He was a wonderful person and will be "
"Condolences to all Rays family. " Ray Litt ~ at Palmerston and District Hospital, on Saturday, October 20, 2018, Frederick Ray Litt, of Harriston, in his 89th year. Remembered by his brothers and sisters, Hugh and Eleanor Litt of Clifford, Lyle and Arlene Litt of Howick Township, Ethel and Don Weber of Clifford, Dale Litt of Clifford, Sandra Zehr of Listowel, and David and Bev Litt of Kitchener, and by his many nieces, nephews, and friends. Predeceased by his brother Leonard Litt and his wife Ethel, sister Ruth Wightman and her husband Ray, brother-in-law Garry Zehr, and by his parents Frederick and Alvina (Kaufman) Litt. The funeral service will be held at St. John’s Evangelical Lutheran Church, Clifford, on Tuesday, October 23rd at 2:00 p.m., with visitation from 12:00 noon until 1:45 p.m. Pastor Jody Rinas officiating. 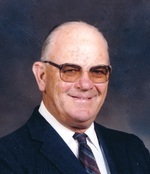 Memorial donations to St. John’s Lutheran Church, Clifford, would be appreciated, and may be made through the Hardy-Lee Funeral Home, Harriston.